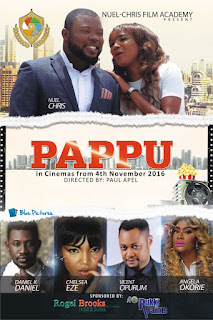 Nuel Chris Film Academy in association with Paul Pel Tech presents one of the finest combination of actors, in this one titled ''Pappu''. 'Pappu' is a romantic comedy with a fascinating plot. 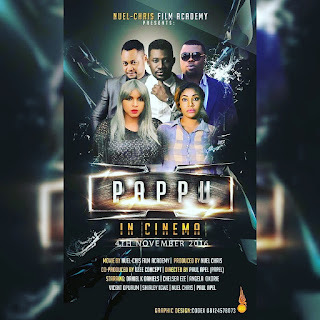 The movie is written by Pius Peters and Directed by Paul Apel (the director that delivered Mr & Mrs). ''Pappu tells the story of a Warri born area boy who is released from prison and offered job as a waiter at his uncle’s bar in the City. However, upon his arrival, he couldn’t let go of his Warri ways; causing chaos in the business''. 'Pappu' stars AMVCA and AMAA award-winning actor Daniel K Daniel alongside other top acts like Chelsea Eze, Vincent Opurum, Angela Okorie, Nuel Chris, Shieley Igwe and a host of others. The movie, scheduled to be released accross Nigerian cinemas on the 4th of November. It was shot at various locations in Nigeria and London.